The great white shark is one of the most feared animals in the ocean. 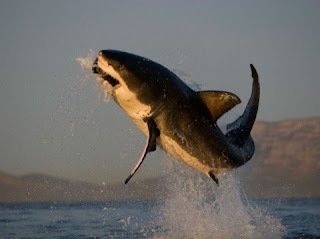 At the Seal Island at False Bay, South Africa, great white sharks regularly launch themselves out of the water, using momentum to kill seals. Anyway, a team of researchers have decided to decode the science of breaching. They dropped decoy seals into the water to elicit 121 Great White strikes over a period of years. 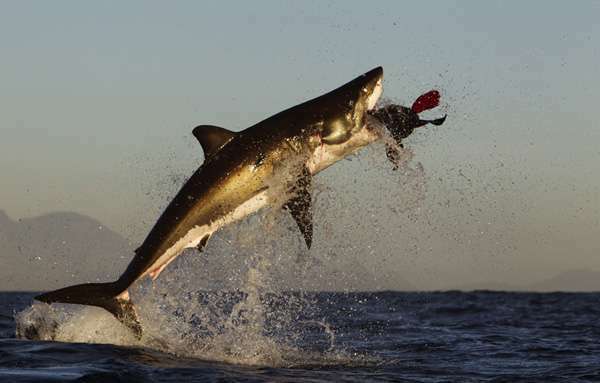 Using the data of how high the sharks jumped, they were able to calculate how fast they were moving. "For example, on 18 June 2002, broadside to our observation vessel, a 3.5-m white shark performed a breach with a height of at least 2.4 m, a water-escape trajectory of ±45 degrees, and duration of 1.2 s,"
That is to say, an 11.5-foot shark jumped 8 feet out of the water and caught air for more than a second. 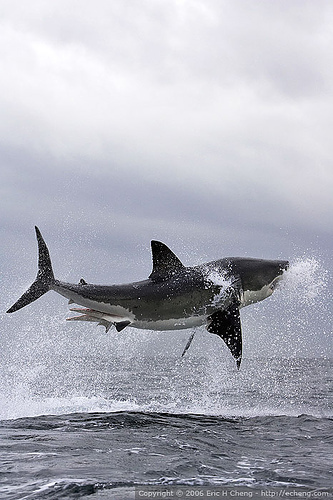 Doing the math, they estimated that the sharks got up to speed of almost 10 meters a second (or greater than 21 miles per hour)! 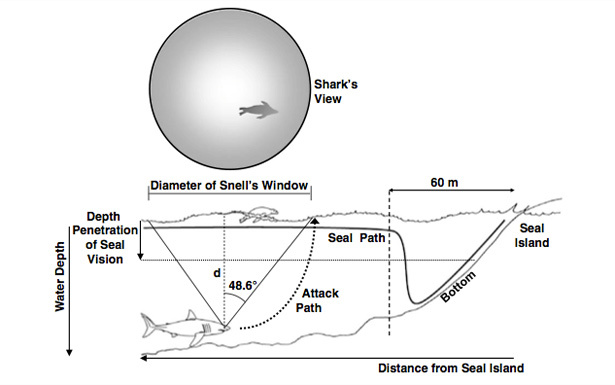 Most shark attacks on seals occurs where the bottom depth of the water was 26-30 meters. In those circumstances, the researchers calculated that the sharks would reach the seals in around 2, 2.5 seconds after they begin their strikes. That's not much time for a seal to get out of the way, which is one reason that the attacks have a 40 to 55 percent success rate, depending on the lighting conditions. If you think staying in the boat is safe, think again. On July 19th 2011, a 3 meters great white shark breached and landed in an ocean research boat, shocking a field specialist and her crew. The 500kg shark had landed with only half of its body onto the boat and the researchers hoped that as it thrashed it would make its way back into the water. 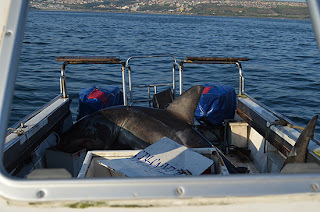 But instead the panicked shark worked itself into the boat. The shark began thrashing around, destroying equipment and cutting the fuel lines as it twisted and turned on the boats deck. To cut a long story short, they eventually released the shark back into the ocean.